Earlier this month, an American hero was featured in a Georgia newspaper. The Georgia native led an extraordinary life and succeeded in a participating in a “Secret War” that is still not often talked about today. What is amazing is that this Secret War took place nearly 60 years ago in Korea. Ben Malcom advised the 8240th Army Unit Guerrilla Division and chronicled his experiences in White Tigers: My Secret War in North Korea. 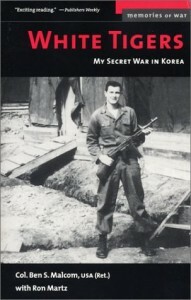 His book is the untold story of the U.S. Army’s role in guerrilla warfare during the Korean War. As an Army first Lieutenant, Ben Malcom was personally selected to go behind enemy lines for the sole purposes of recruiting, training and leading North Korean partisans in their war against the Chinese and North Korean forces. He writes how he won the guerrillas’ trust and, with little support from Far East Command, mounted a series of covert operations that combined sabotage with intelligence-gathering. Today, Malcom travels and attends speaking engagements to tell the story of his secret war. His book is available at Amazon.